Land Rover has confirmed that its new long-awaited next-generation Defender model will be fully revealed during 2019 with first customer deliveries from 2020. 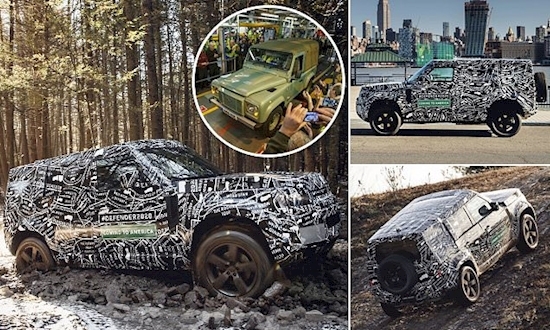 As the rugged new 4X4 continues its testing phase - already seen on UK roads under camouflaged disguise - the British manufacturer said prototypes have arrived on US soil in the New Year as part of the off-roader’s world-wide extreme capability testing. Available in short- and long-wheelbase versions, prices are expected to start from around £40,000 - but there's a good chance it won't be built in the UK. Although Land Rover has yet to make an official announcement on production, it is widely believed that the new off-roader will be built abroad at the firm’s massive new state of the art factory in Nitra, Slovakia. The new would be another blow to the firm's UK workforce, following a series of job cuts - the latest coming just before Christmas - and voiced concerns about the impact of Brexit by Jaguar Land Rover. The respected international journal Automotive News Europe reported earlier this month: ‘The Defender will be built in JLR's 1.4-billion-euro plant in Nitra, Slovakia, which opened in October, IHS Markit has said. The factory already builds the Land Rover Discovery large SUV, which moved from its former production site of Solihull in the Midlands. It noted: ‘Testing of the new vehicle is already underway around the world with the first development mules and prototypes reaching North American shores earlier this month. Land Rover said its engineers will subject the vehicle to rigorous test extremes ‘to make sure the new Defender is the most off-road capable Land Rover vehicle ever’. Test vehicles will operate in temperatures as low as -40 Celsius and as high as 48 Celsius and at altitudes of 13,000 feet above sea level. Jaguar Land Rover UK managing director Rawdon Glover said: ‘We are enormously excited to be revealing the first member of the Defender family during 2019 with UK customers taking delivery in 2020. With the judgment of faithful Defender purists in the balance, Land Rover says the next-generation Defender will be‘a revolutionary product with broad appeal, an all-new exterior and interior design, which nevertheless is ‘respecting Defender’s unmistakable shape' - as you can see from the images. Prices are set to start from around £40,000, though Land Rover is expected to have a range of models under the famed moniker. As well as short- and long-wheelbase versions, there could also be a high-performance SVR model and other more luxurious takes on the Defender, with prices estimated to rise as high as £70,000 for the offroader. The previous Defender, launched originally in 1948 as a Land Rover Series 1, ceased production in January 2016. Second hand values have since become collectors’ items and rocketed in value - forcing owners to safeguard their vehicles with car thieves targeting the in-demand classic. Billionaire British tycoon Sir Jim Ratcliffe is also planning a ‘back to basics’ 4X4 to fill the gap left by the original Defender.